Berardinelli-Seip congenital Lipodystrophy (BSCL) is a rare autosomal recessive disease characterized by almost complete absence of adipose tissue. Because of it, they have hypertriglyceridemia with fat ectopic deposits and regularly develop diabetes mellitus and steatohepatitis. Primary objective: Evaluate the grade of steatosis and liver fibrosis, the body composition and metabolic profile of three patients with BSCL. Second: evaluate the body composition in this syndrome with Dual energy X-ray absortiometry (DEXA). Hepatic impairment was evaluated by liver elastography ultrasound through wave M and X using FibroScan 502. DEXA (Lunar Prodigy Advance) and also Bioimpedance analysis (InBody 270) were used to assess body composition. Blood samples were collected after 12 hour fasting state to measure lipids and glycemia. There retina were also by indirect ophthalmoscopy method. Patients 1 and 3 were diagnosed late, by the age of 54 and 43 yrs. respectively. While the second patient was diagnosed earlier at 17th and follows 14 yrs. in treatment. 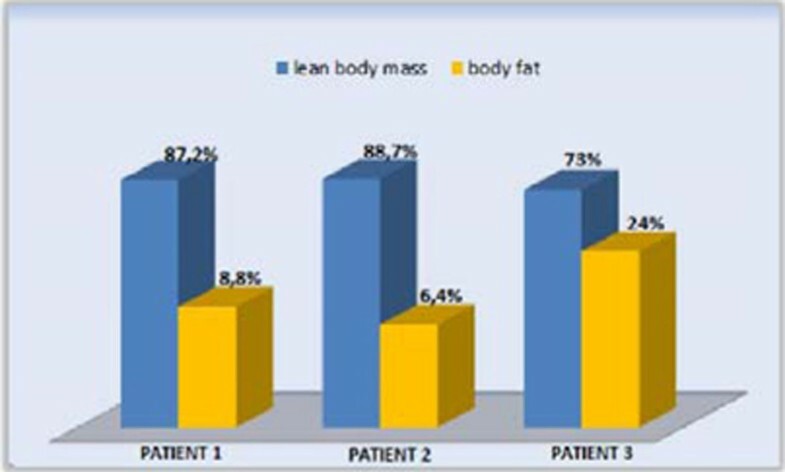 All patients have low body fat on DEXA (Figure 1) and moderate steatosis, but only the Patient 2 has no fibrosis. The patients' metabolic profile after the treatment is exposed at Table 1. All patients are in use, at least for 2 yrs., of TZD (30 mg/day), MTF (2000mg/day), insulin (2.01 UI/kg±0.36) and atorvastatin (20-40 mg/day ). Only Patients 2 and 3 are in use fibrate because the Patient 1 had CPK elevation with this. 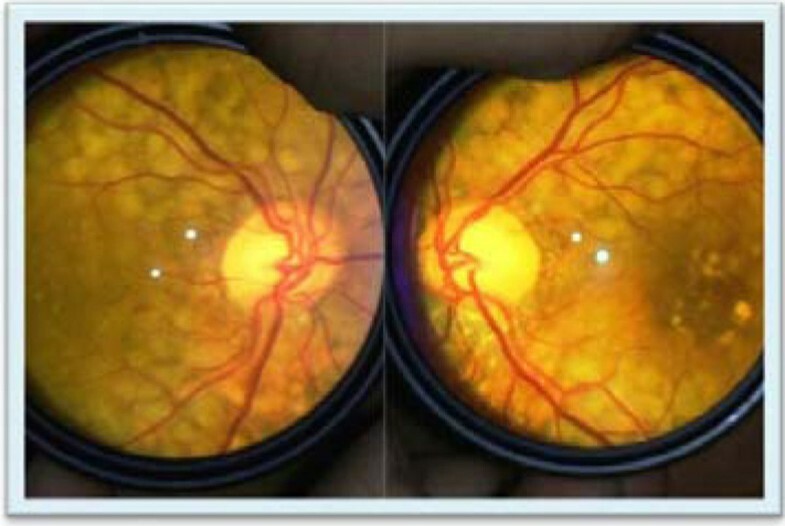 Patient 2 fundoscopy showed significant deposition of triglycerides in her retina (Figure 2). Steatosis duration seems to be an important factor for liver fibrosis, since the two oldest patients had fibrosis and the youngest did not. These patients have very low percentage of fat tissue by DEXA. Hyperglycemia and hypertriglyceridemia in BSCL patients is very common, despite the use of insulin sensitizers, high doses of insulin and lipid-lowering agents.